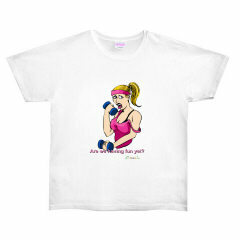 T-shirts for Baby Boomers! Aging/birthday humor & wisecracks. T-shirts for Baby Boomers! Aging & birthday humor, "Midlife Mindy & friends" & lots of customizing. hot flash - Is it hot in here or is it me? Now, where'd I put those glasses? hot flash - Who turned up the heat? fitness - Are we having fun yet? weight lifting - Are we having fun yet? exercise - Are we having fun yet? I'll have a soyburger, soy fries & soy shake. Time for my midlife crisis!